The first botanist who has crossed two species of plants was the British gardener Thomas Fairchild (1667-1729). He combined two species of carnations, putting the pollen of Dianthus barbatus on the pistil of Dianthus caryophyllus, to create a hybrid form of both. Fairchild was heavily criticised for manipulating God‘s creation, but the interest to get new kinds of flowers was greater. A long time it was assumed that crossing of flowers with different colours is just like mixing paint on an artist‘s palette. Thus, a hybrid of a red and a white-flowered plant would have a pink colour. In 1866, the Augustinian monk Gregor Johann Mendel proved this theory false. Mendel (1822-1884) discovered the concept of recessive alleles, one of the insights which were later called the laws of Mendelian inheritance. A genetic allele (or DNA sequence) is recessive, when an individual of a certain species needs two copies of the relevant genes so that a certain genetic trait is expressed. If the individual has only one copy, by the male or the female side of inheritance, the trait is not expressed – in contrast to a dominant allele. 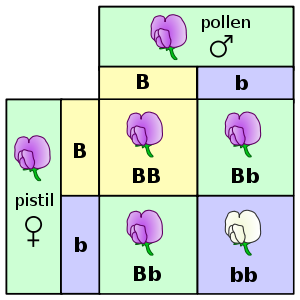 Mendel studied the flower colour of peas and found out that the dominant allele is purple and the recessive allele is white. Individuals with both alleles purple (BB) have a purple colour as well as individuals with one allele purple and one allele white (Bb). Only peas with both alleles white (bb) develop white flowers. Following Mendel, Charles Chamberlain Hurst (1870-1947) was the first who studied albinism in orchids. He discovered that actually two genes are responsible for a certain flower colour: Factor C enabled the formation of colour, while the other factor, R, determined what particular colour would appear (Rohrl, Helmut: For Heaven‘s Sake, It‘s Xanthic! Albinism in Orchids. In: Orchid Digest. Vol 69 (4), 2005. p.241). Each of these genes also exist in an inactive form, c and r. Coloured plants have inherited one or two of the active alleles: CC and RR, Cc and RR, Cc and Rr or CC and Rr. White flowers have either cc or rr. C and R are understood as dominant alleles which determine certain enzymes required by the production of pigments – among them the anthocyanins, which are especially important for flower colour. Since then, much more detailed reasearch into the genetic processes of determining flower colour has been done. At least 35 genes are known to affect flower colour in petunia (Timothy A. Holton/Edwina C. Cornish: Genetics and Biochemistry of Anthocyanin Biosynthesis. In: The Plant Cell, Vol. 7,1995, p. 1071). Among them are regulatory genes, which influence the timing, distribution, and amount of anthocyanin pigmentation. The gene, a certain region of the chromosome, contains the coding for creating the enzymes which are necessary for the biosynthesis of pigments, for their “biochemical pathway”. Thus, the genetic makeup, which is called the genotype, defines the phenotype of a flower, its visible character. (2) inactivation of endogenous genes (Holton/Cornish 1995, p.1077). This can be done by the method of RNA interference (RNAi), when special genes are inactivated so they can no longer produce their specific amino messengers. In the case of our albiflora orchids, nature is going the second way: the biosynthesis of flower colour pigments is blocked. Since there are so many different genes, regulatory genes and enzymes participating in this complex process, there are also different possibilities how this process is blocked or reduced.